The Greatest Antique Show on Earth! We would like to invite you to be a part of a unique experience. You have the opportunity to establish your own business that is open seven days a week. 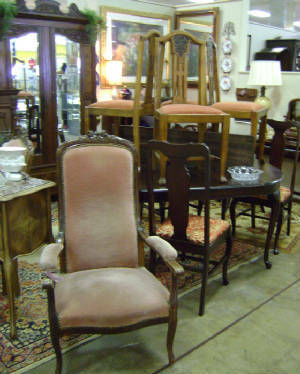 If you are a long time antique or collectibles dealer, or new to the business, this is the place for you! Please come in and ask for a tour of our new building & the availability of booth space. Dollies available for moving merchandise. Storage of items sold through the Front Sales Desk. Storage spaces available for dealers. In house repair services available. Dealer sales checks are dispersed twice monthly. Security staff at each entrance. Complimentary listing on our web sites. Sales floor is over 100,000 sq. ft.
One monthly rental expense keeps your business costs low. We collect and pay the state sales tax on items sold through the Front Sales Desk.